Maybe using data to target web users with personalized ads is only a shady practice when no one wins. Soon, the relationship between websites, advertisers and consumers could change, giving consumers more power and a piece of the profits while advertisers get the data they actually covet. The balance of power is shifting thanks to “Do Not Track” functions and possible data privacy legislation, meaning websites might have to live with a default setting that limits the amount of data they can collect about visitors. However, a new batch of startups is betting many users will actually choose to hand over a lot more — and a lot more valuable — data in exchange for a few bucks. Their theory appears to be that for many consumers, privacy isn’t so much the issue as is getting a piece of the profit companies’ are making off those consumers’ data. These startups are onto something, although the most important question going forward might be whether users really want control of their data or if they just want to get paid for it. Right now, the most-popular method for helping users make money off their data is that of a data locker or brokerage. Some prefer to use the stock market analogy. Essentially, though, we’re talking about a third-party service that stores user data — far better, deeper and more-curated data than most companies could obtain from tracking web behavior — and then sells it or gives users access to it for a price. One of a handful of startups (along with personal-data locker service Personal) trying to advance this model is Enliken, which focuses on figuring out how to facilitate quid pro quo exchanges between advertisers and consumers. The idea behind the company, Founder and CEO Marc Guldimann told me during a recent interview, is that psychographic targeting hasn’t really worked out how it was supposed to; meaning “individuals always end up getting screwed.” They’re getting tracked, ads are somewhat haphazardly placed in front of them based on what some advertising platform thinks it knows, and the only benefit they receive (if you can call it a benefit) are ads that are marginally more likely to appeal to them. Enliken’s solution is to chip away at the status quo and “with the goal of eventual turning data into a micro-currency,” Guldimann said. Information + demand = Money! Once consumers know what kind of data is actually being collected about them, they can make a more-informed decision about how to act. One option might be to go ahead and click the “Do Not Track” button wherever they can. However, another might to realize the overall low quality of the information that advertisers have and smell an opportunity to make everybody’s lives better. 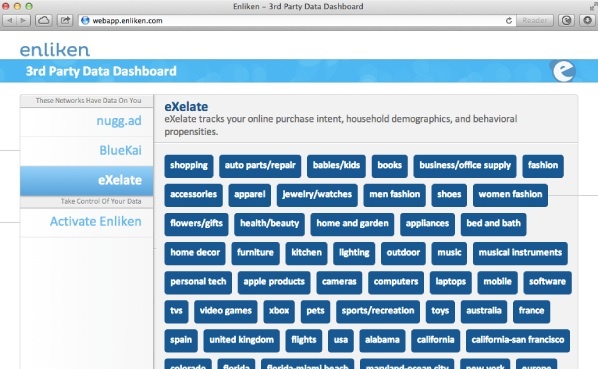 With Enliken, users can edit, control and even prioritize the data they want advertisers to see, thus making the data richer and more-valuable. Enliken will then sell the data to advertisers, keeping a portion of the proceeds for itself and donating the rest to a charity of the user’s choice. In the future, Guldimann thinks the model could expand to include forms of credit from advertisers (e.g., frequent flyer miles or product discounts) that consumers could use on websites instead of whipping out their credit card for every purchase. Why not cut out the middleman? However, for companies such as Facebook or Google that already have mountains of personal data and, according to some experts, could actually suffer at the hands of data brokers, the answer might be less about transparency and more about simply encouraging the behaviors in which users are already engaged. In January, for example, I suggested Facebook might be able to quell concerns about the company profiting off its users by paying them (in cash or, more likely, Facebook Credits) for certain activities. Perhaps, rather than charging for an ad-free service, Facebook could also consider paying users who decide to let the platform use more of their data or share more with advertisers. There’s evidence to suggest such a strategy could work. 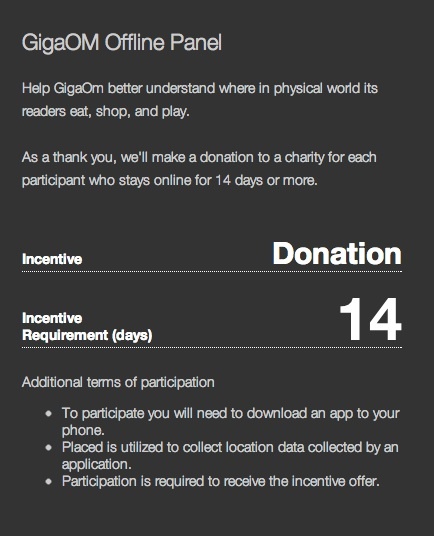 For one, Google (s goog) is already trying to learn even more about users’ behavior by paying some of them in $5 Amazon (s amzn) gift cards to be able to track the web sites they visit. Other users willing to install a physical appliance that tracks network activity on behalf of Google stood to make hundreds of dollars in cash. And then there’s location-analytics startup Placed, which we’ve covered before because of its novel approach to determining where people are when using mobile applications. Since announcing it in mid-October, the company has already had more than 220,000 downloads of an app that tracks the brick-and-mortar businesses that users visit for a certain length of time. Placed Founder and CEO David Shim said the app is part of a service called Panels that helps companies gather comprehensive offline behavioral data — something they’ve never really been able to get before. He doesn’t see any concerns about privacy because consumers have to manually download the app after being approached by a company to do so, and then opt into the service at multiple points. As long as it doesn’t require much effort (Placed Panels “doesn’t require a check-in or doesn’t require explicit actions to take place,” he explained) and users are getting something in return — say, $5 gift cards from Target (s tgt) — many consumers seem perfectly happy to fork over a bit more data. Whatever the approach, though, Enliken’s Guldimann thinks the balance of power between consumers and websites is bound to sway as the demand for richer data spikes and advertisers try to get it without upsetting consumers and regulators. User-curated interests, recent purchases, connections between web, mobile and physical personas — it’s an ad-targeting gold mine that’s largely off limits or very difficult to obtain today, and much effort goes into data science that tries to fill in the blanks. “As an advertiser, you never really have this complete picture of an individual,” Guldimann said. Putting a few dollars back in the pockets of consumers might be the trick to getting it without facing a privacy firestorm down the line. Feature image courtesy of Shutterstock user Denis Vrublevski. I have always seen that greater transparency drives better engagement with customers. Everybody likes to know what and who they are dealing with and to feel equal. When people feel manipulated, they disengage and feel alienated. Companies that believe data is a legal hurdle and ignore the ethical, moral and consumer feeling side of things are the ones that will start to lose out as consumers become data savvy and equipped to ask the right questions. Don’t be an ostrich or laggard on data transparency, start pushing now for what is right for everybody.